This is the new website of Taj Cuisine, Chatham's premier restaurant. The restaurant is based in the Walderslade Centre on Walderslade Road. Our outstanding selection of Indian and Bangladeshi dishes are specially prepared by our own experienced chef. To enhance your dining experience further you will be served by well trained staff who are always available for your service. Our award winning chef at the Taj Cuisine Walderslade, in the heart of Kent, the Garden of England, produce a wide range of Superb Asian Dishes, truly a dining experience second to none. At Taj Cuisine we pride ourselves in providing a sophisticated, warm, and friendly atmosphere, where you can choose from a wide range of mouthwateringly irresistible Asian Dishes. To enjoy help you enjoy our tasty Indian cuisine, we are pleased to offer Online Ordering. If you would prefer to enjoy our food with a takeaway, please visit our Takeaway Menu You can choose the exact time you want to collect you order from our 1 Sherwood House restaurant in the Walderslade Centre in Chatham. Which ever way you order all of us here at Taj Cuisine in Chatham cannot wait to serve you. 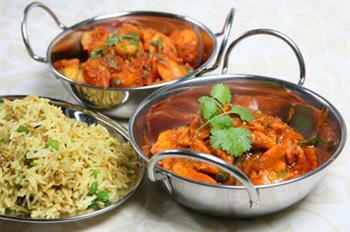 Here at Taj Cuisine an Indian Takeaway in Chatham, we have a wide range of menu options. Serving delicious Indian food, we are sure we have something for you to enjoy.